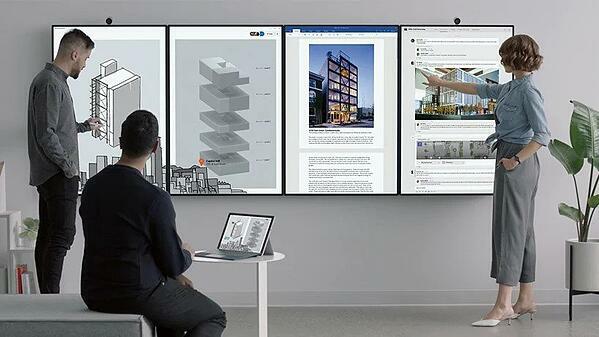 With the original Surface Hub no longer available, all eyes are on the upcoming Surface Hub 2. April 17th is in the calendar as the day that Microsoft shares the latest news of the Surface Hub 2S in New York. Microsoft have been tight-lipped on the detail of the event, with the press invite reading “Microsoft & Steelcase invite you to experience new ways to work better, together” – You can read more about Steelcase’s relationship with Microsoft here. Microsoft have played their cards close to their chest on this one, simply stating that it will be competitive against other similar market offerings. As a reference point the slightly bigger Surface Hub 1 at 55" came in at £7,000 - yet the Google compete, the Jamboard, comes in at a very competitive £4,000 - we don't expect the Surface Hub 2 to come in that low - Microsoft is a premium brand. Does Surface Hub 2 come in multiple sizes? Although the original Surface Hub came in both 55" and 84", the new Surface Hub 2 is only available in 50.5" - need more space? Buy the 2X and tile them. You'll need to budget for installation and if you want to be more mobile a stand from Steelcase as well as an adoption plan unless you just want an expensive PowerPoint display screen! Microsoft 365 users are the natural fit, the Surface Hub 2S is a hybrid cloud solution whereas the Surface Hub 2X is cloud only. What's the difference between the Surface Hub 2S vs 2X? Can I upgrade from the 2S to the 2X? Yes, by upgrading processor cartridge, at additional cost, you can future proof your investment. Rumour has it that Microsoft were put in a squeeze by stopping production of the original Surface Hub and then moving production to new a factory which caused delays and hence the interim solution of the Surface Hub 2S. Looking at introducing Microsoft Surface to your organisation but not sure where to start?